Ice found on mars. Phoenix now seems to have confirmed that similar features on Mars are caused by the same processes as those on this planet. Scientists say they found evidence of ice on Mars. 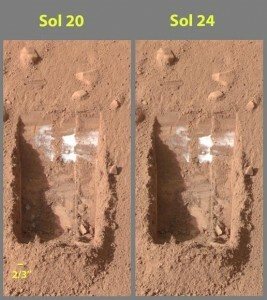 Nasa’s Phoenix spacecraft discovered evidence of ice in the soil around its landing site on Mars. 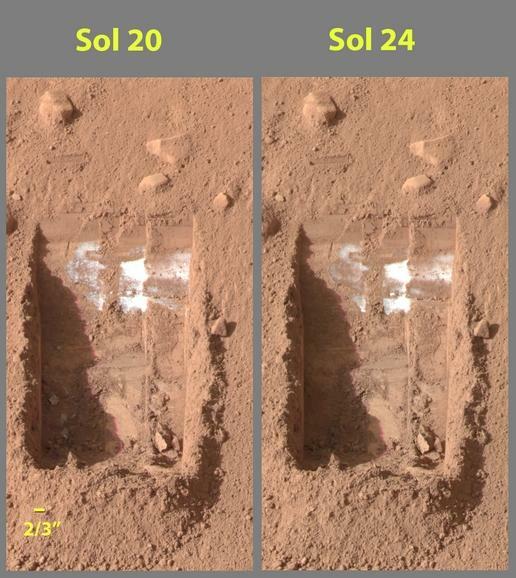 Following images were acquired by NASA’s Phoenix Mars Lander’s Surface Stereo Imager on the 21st and 25th days of the mission, or Sols 20 and 24 (June 15 and 19, 2008). These images show sublimation of ice in the trench informally called “Dodo-Goldilocks” over the course of four days. In the lower left corner, lumps disappear, similar to the process of evaporation. These little clumps completely disappearing over the course of a few days, that is perfect evidence that it’s ice. There had been some question whether the bright material was salt, but salt can’t do that.